A spray nozzle is a device which makes use of the pressure energy of a liquid to increase its speed through an orifice and break it into drops. Its performances can be identified and described precisely, so that the design engineer can specify exactly the spray nozzle required for a given process. The liquid flow delivered as a function of the nozzle feed pressure. The opening angle of the produced spray. The nozzle efficiency, as the ratio between the energy of the spray and the energy used by the nozzle. The evenness of the flow distribution over the target. The droplet size distribution of the spray. Many different techniques can be used to produce a spray, and most of them are used today for nozzles to be applied in industrial processes. 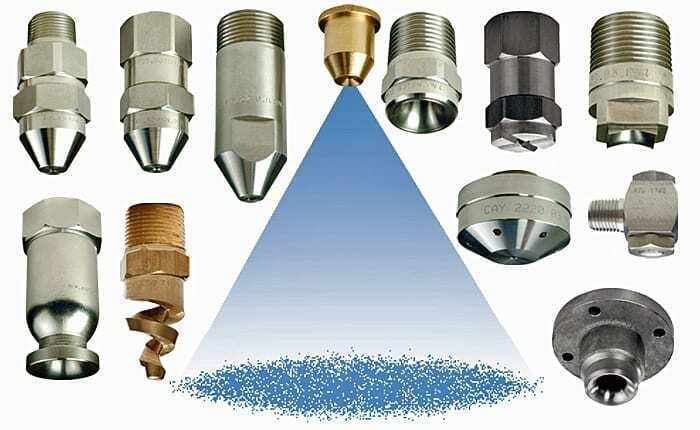 Based on the different techniques, the following nozzle types can be used in industrial applications to generate a liquid spray. This is the simplest type of nozzles, where an orifice is opened into a chamber where the liquid to be sprayed is fed under pressure. A spray is produced through the orifice with spray pattern, flow rate and spray angle depending upon the orifice edge profile and the design of the inside pressure chamber. 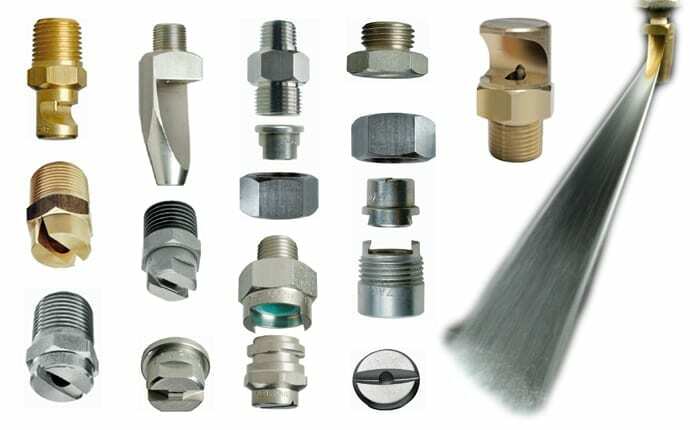 Typical pressure nozzles are the flat jet nozzles series GA, J, GX and GY. In these nozzles the liquid moving towards the chamber preceding the orifice is given a rotational speed component, so as to open up in a conical shape as soon as it leaves the orifice edge because of centrifugal force. Based on the nozzle design and the technique used to generate the rotational speed, the drops produced can be confined to the cone outer surface (hollow cone spray) or be evenly distributed to fill the entire volume of the cone (full cone spray). Here the desired spray shape is obtained producing an impact of the liquid jet onto a properly designed surface. The liquid jet is subsequently changed into a fluid lamina and then broken into drops with the desired spray pattern after leaving the nozzle edge. Fine and very fine sprays can be obtained by means of air assisted atomizers, working upon various different principles. More detailed information about air assisted atomizing can be found in our Catalogue “Air assisted atomizers”. Several technical features must be taken into account to select the proper nozzle. A spray nozzle is a device that turns the pressure energy of a liquid flow into kinetic energy. The nozzle efficiency can be defined as the ratio between the energy available at the nozzle inlet and the energy wich is actually used to increase the liquid speed and create the spray, the difference being the energy lost during the process because of friction. 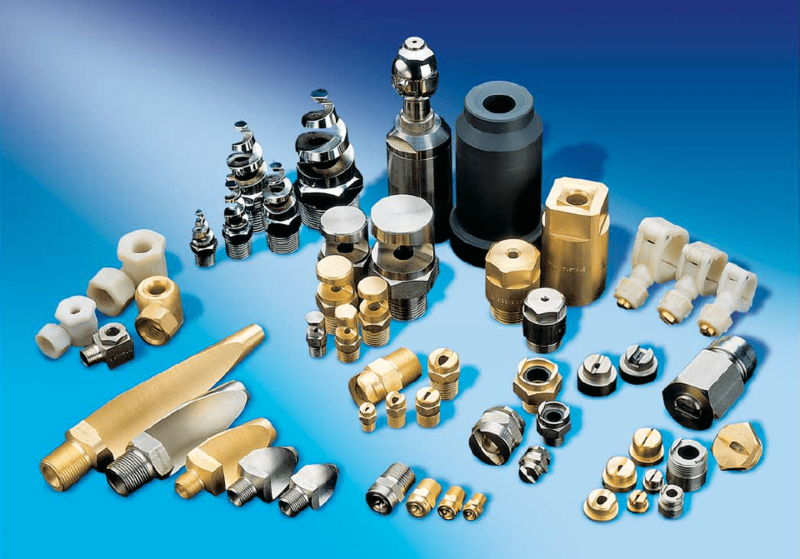 Depending on the nozzle type and for a good quality machining, the nozzle efficiency varies between 55% and 95% for the types that are commonly used in industrial processes. What above stated is not valid for air-assisted atomizers which require a much higher energy because of the losses inherent in the energy transfer from compressed air to liquid surface. The impact force is the force generated by the jet of water deflected by the impact surface and its strength is often expressed in kg/cm2 or lb/inch2. The uniformity of a jet impact force and distribution influence the washing effect. Under the same operating conditions (same pressure and capacity), different types of nozzles can be used to perform an impact force test. Engineers design nozzles with different spray distribution patterns. Patterns can be solid stream, full cone, hollow cone, flat spray, spoon flat fan. 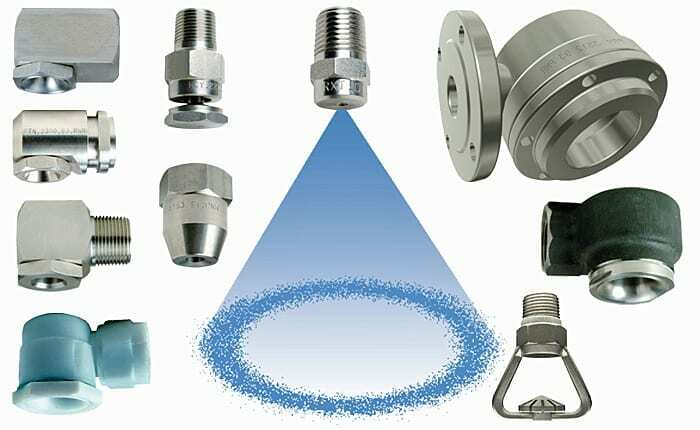 The nozzle design aims at the uniformity and impact force of the jet sprayed whether nozzles are used individually or overlapping.